Oh no, this was not his natural background, this heaving water which retained nothing on its surface for long. This was 11 January, and the genesis of the case, dated 3 October, was out here far from land. Life and the elements leave their records on the bush for years; but here on the sea life and the elements left no record for even such as he to read. In all his bush cases he had many allies: the birds and the insects; the ground which was like the pages of a huge book wherein were printed the acts of all living things; the actions of rain and sunlight and wind. And greater than all these added together was his ally Time. And now of all his former allies only Time was with him. Here lies another author I would never have discovered without working in ye olde secondhand bookshop and being familiar with its ‘literary crime’ section. Books of this genre are characterised by their size, being neither the new-release “trade paperback” size or the pocket “A-formats” that generally follow. Literary crime novels are usually “B-format,” the same size as your literary fiction, and as they never fit in the general and crime fiction “troughs” so were generally poked into their own sad little section underneath that no-one saw. This was a shame, because these are some of the best books: a little off the beaten track in content as well as location, they represented the best of both worlds. Arthur Upfield proves that this holds true now as ever, a classic example of this rather unlikely genre: this Australian 1940s author’s hero is detective inspector Napoleon Bonaparte, investigator extraordinaire, bush tracker unparalleled and identified as was in those days called a “half-caste” Aborigine. Upfield’s mysteries have earned their place as classics in Australian as well as crime fiction. In this title “Bony”, as he prefers to be called, is asked to go to sea, a little swordfishing town called Bermagui on the coast of New South Wales, He must investigate a murder that appears to have occurred on the open water, and that has baffled the local and regional police. I wondered for the first part whether I would be bored. I am not a particular fan of things angling or any stories that smell of the ocean – for someone who pities genre snobs, I sure do avoid general thrillers and seafaring fiction. But the passion and suspense of hunting game fish, with all accompanying bloodlust, is masterfully done in this book. I, poor innocent, soon realised that swordfish were not the two or three-foot jobs I had imagined and I quickly became fascinated. I did a lot of Google-imaging before I was sated. What begins as a charmingly dignified old-school mystery ends in a satisfying wash of adventure. Without having even familiarised myself with Bony’s usual stomping-ground, I am delighted by the story of his being a fish (ha!) out of water. When I am in my native bush, gentlemen … everything I observe, except the clouds, is static. On the sea nothing is static. A ship does not leave tracks on the sea. And oh, the mystery! I was quickly sucked into this tale, with its distinctly Agatha-Christie type premise of a fishing launch, the Do-me, that vanishes without a trace, and the discovery of the murder of one of those aboard when we know she was seaworthy and those on her trustworthy. Like Marple or Poirot, Bony adores a puzzle such as this. And so, having read all their reports and having gone through their collection of statements, I decided that this was a meaty bone on which to try the teeth of my brain. It is certainly an out of the way case. I have to admit that I shy clear of crimes of violence where there are fingerprints and revolvers, bodies and missing valuables, and a nark or two in a thieves’ kitchen waiting to inform for the price of a beer. I like my cases minus bodies and minus clues, if possible. Which is why this Do-me case so attracts me. A note on historical context – apart from the occasional alarming use of the word half-caste, which is to the modern reader the equivalent of throwing a grenade on to the page; and a slightly hair-raising instance of Bony’s “Aboriginal instincts” rising up in a time of extremity to allow a “primitive” rage to rise to the surface, these instances are in exception to the general tone of the book, which has minimal reference to Bony’s origins, apart from the occasional pointing out the lack of prejudice other characters greet him with once they witness his “educated” voice and elegant manners. Perhaps in the other books’ more landlocked settings the racial elements are more pronounced. 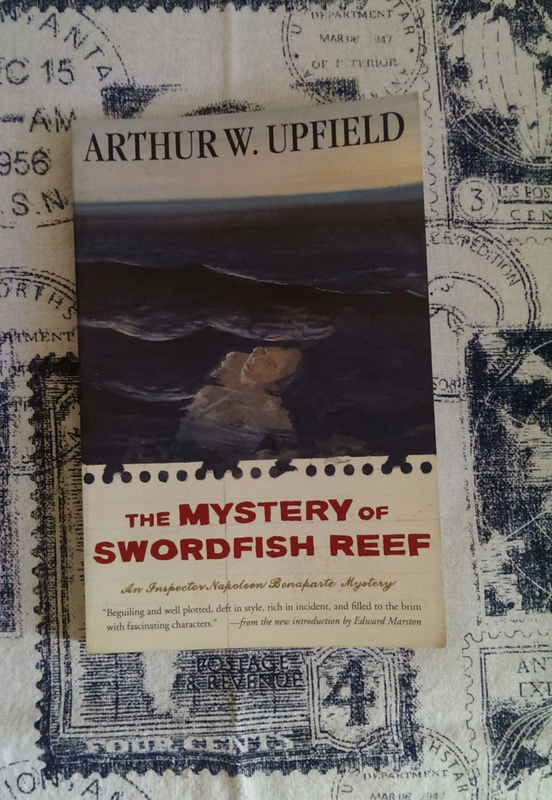 Add to Upfield’s masterful mystery and delightful hero a pretty turn of phrase, and like a swordfish, I’m hooked. (Sorry, I’ll stop.). I have found another crime writer I love… as if I needed one. More on The Curing of a Bibliomaniac here. Enter your email address to follow this blog and get emails about new posts.